Listen to the talks about St. Pius X given in Portland, Oregon by Louie Verrecchio and Fr. Joseph Wood. During the prior year of 2014, the Society of St. Pius X commemorated in a variety of ways the 100th anniversary of the death of its saintly pontiff patron. One event that has gone previously unreported is the dinner conference hosted on November 22nd at Our Lady of Fatima Chapel in Portland, Oregon which included guest speakers, Louie Verrecchio and Fr. Joseph Wood. The conference topics concerned an Italian pope, St. Pius X, hence as initially remarked by guest speaker Louie Verrechio, the anniversary conference was appropriately held at the local Italian restaurant of Ernesto's, amongst good food of Italy, wine, and a family-like atmosphere of clergy and faithful. Introduced by the pastor, Fr. Jonathan Loop (pictured above), the first of the two conferences was given by Louie Verrecchio who compared the ideals and form of government of St. Pius X and Pope Francis (see also his post-conference comments below). Fr. Joseph Wood followed with a talk about why Archbishop Lefebvre chose St. Pius X as patron. The conferences were concluded by Fr. Loop with some gracious remarks to those who made the anniversary dinner conference possible. It was a great honor for me to receive Fr. Loop’s invitation to give a conference commemorating Pope St. Pius X, but it left me with a real conundrum: How does one do justice to such an exemplary pontificate in just 45 minutes! Ultimately, it occurred to me that focusing on the glorious memory of Pope St. Pius X, as if to avail ourselves of little more than a history lesson, is to miss out on the fact that his legacy provides a veritable road map that can point the way forward for the Church in our day. As such, I decided to address the stark contrast that exists between Pope St. Pius X and Pope Francis relative to each man’s understanding of the duties that are incumbent upon the Successors of St. Peter. In order to get our hands around the trajectory of the current pontificate, we turned primarily to the Apostolic Exhortation, Evangelii Gaudium, wherein Pope Francis sheds considerable light on his intentions. In the case of Pope St. Pius X, we mainly focused on an Apostolic Letter that was sent by His Holiness to the bishops of France entitled Notre Charge Apostolique, the purpose of which was to address a wayward socio-political movement that has a great deal in common with some of the currents running, not just through various nations today, but through the Church itself. In the process, we discovered that many of the errors that are so prevalent in the Church in our day are not entirely unlike those that were met head-on by Pope St. Pius X. In fact, Notre Charge Apostolique reads in places as if the Holy Father somehow managed to obtain an advance copy of Evangelii Gaudium and was addressing its many shortcomings directly! All in all, it was a great pleasure to gather with Fr. Loop and the faithful of Our Lady of Fatima Chapel, to examine the great treasure that is the pontificate of Pope St. Pius X in the light of Pope Francis’ anthropocentric vision for the Church moving forward. In the end, I am confident that all present were reminded once more that the remedy for every evil and error is ever the same; a remedy summed up well in the motto of Pope St. Pius X, Omnia Instaurare in Christo! 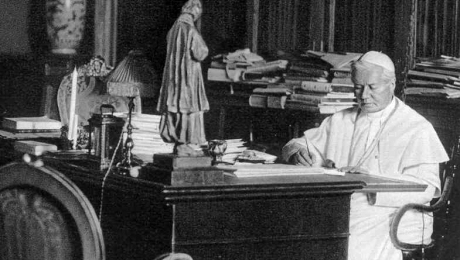 Why is St. Pius X the Society's patron? Introduction to our FAQ video series!